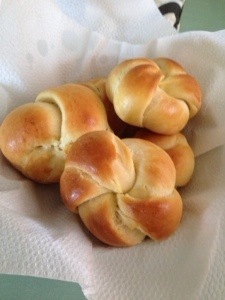 I’m not sure if these can be called Kaiser Rolls. These are not plain hard rolls. I made these with a bread recipe which has butter, egg yolks and milk. So this has a slightly rich and brioche-like texture and flavor. Oh well. I shaped like Kaiser Rolls so I’m going to call them that. 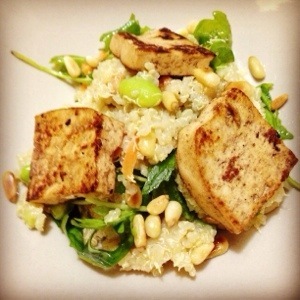 This salad contains ingredients I love : Tofu, Quinoa, Pine Nuts and Edamame Beans. I tossed some rocket leaves too. And speaking of Edamame, I just snacked on a huge bowl of them. I only ate the beans although I’ve heard that the pods can be eaten as well. Not really into the chewy texture of the pods but the beans, yes please! -hazrock, another bowl of edamame, why not! 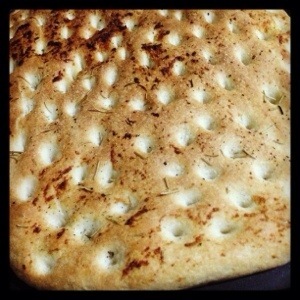 Foccacia! One of my absolute favorite breads of all time. I used them to make sandwiches and canapés. Those flavorful ones get eaten as is. This one has rosemary and garlic, just classic flavors. 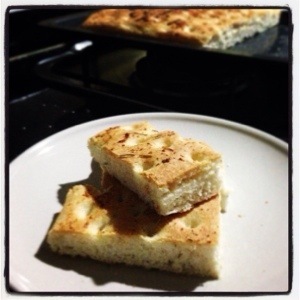 The best part about making Foccacia is the poking of the dough to make the signature dimples. And after it has been proofed and baked, it just looked so mesmeric and spectacular! 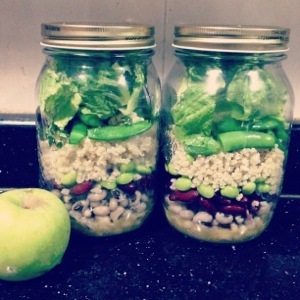 To me, ingredients and cooked food stored in mason jars are so pretty to look at. I came across this idea of a salad while googling (can’t even remember what I googled). I love this and to be honest, this picture always makes me smile. The dressing of the salad goes into the bottom of the jar, so that it can be poured over the salad as I dump the whole thing in a bowl. Salad leaves should be placed on top, away from the dressing so it won’t get soggy. I like the flavor of honey-mustard dressing, but in this case, honey is replaced with maple syrup. I always must have some sort of meat in my salads. And since I wanted to keep this vegan, I opted for quinoa instead. Ahh quinoa! My new love. 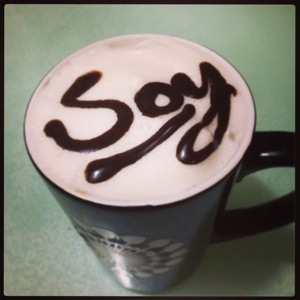 Anyway I’ve never thought of drinking coffee with soy milk. After trying it, my verdict is : Nahh… I rather have cow juice with my coffee. I think I only know that song by Everything But The Girl, and only that. A song of longing and missing someone. Kinda stalker-ish too. 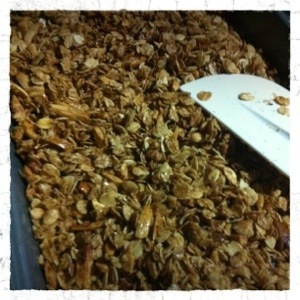 I made Homemade Granola again last night. I missed it and I wanted something light and crunchy for breakfasts the next few days. Hey, maybe I’ll even make some Granola Muffins if I’m in the mood. This granola would be great if it has tons of nuts and dried fruit. I had to compromise with my 11-year-old son, Razin, because he doesn’t like dried fruits. Plus, he said raisins sounded like his name and he doesn’t want to eat himself. You silly boy! Haha! So I only put slivers of almonds and chopped walnuts in it. 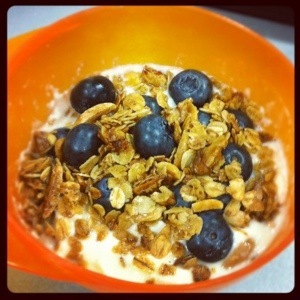 I had brought some of the granola to work to eat as breakfast. Along with some natural yogurt and fresh blueberries. Note to self : Next time use Greek yogurt. Thick, luscious and creamy. To die for! … A little more eating, please! 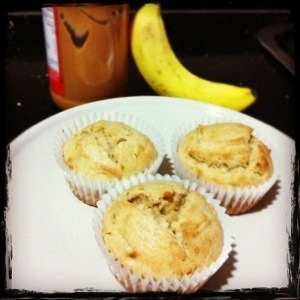 This blog would be a continuation of my current obsession, a peanut butter and banana combo. See previous post, Jailhouse Rock. And I can’t help thinking about everything Elvis when I think about peanut butter and banana. Anyway, these muffins are ridiculously easy to make. And I literally whipped them up in minutes. Just imagine. You crave some warm homemade muffins and you get them in 30 minutes. And they are made from scratch too! I already have all the ingredients on hand. Even the very ripe bananas, which is uncommon because my little monkeys LOVE bananas and they always want some when they see the bananas hanging in my kitchen. So it was really a little light mashing and mixing and the muffins were ready to be baked. 15 minutes later, we were eating! I love cooking like this. Quick, easy and not much utensils to clean.